I saw that picture on their website and thought "isn't that? ... well yes it is"
Gangster, that's good news! From what you have written, it sounds to me like your husband truly loves you. Be grateful for that. Just be patient while you iron out the "kinks" in your marriage. All in all, it sounds like you had quite a memorable trip. That was actually right after I broke up with Geddy. 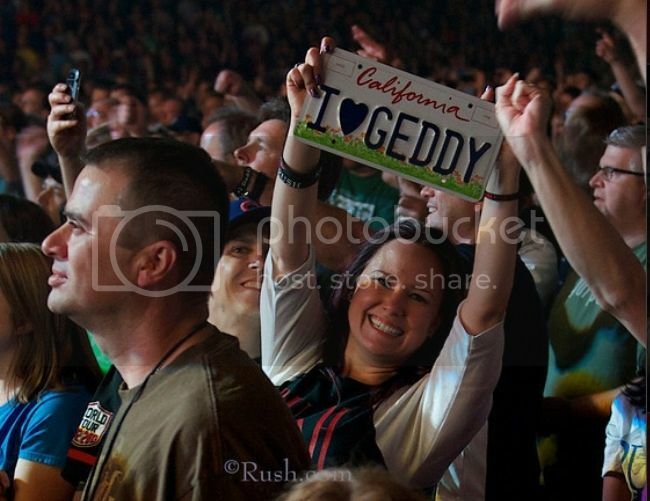 In that case, you won't be needing your "I Geddy" plate anymore. Send it to me. Looks like I (heart) ALEXL might be up for grabs. I kind of want to experiment though. Next tour I want to be all skinny and fit and maybe blonde again and then I'll see what reaction I get. Edited by gangsterfurious, 24 August 2013 - 12:18 PM. Sounds great Ganster! Marriage is hard, There are good years and Bad Years and these are the years you need to work through. Maybe this bad year is on its way towards being behind you now. If not buy yourself a whip! Edited by losingit2k, 24 August 2013 - 12:32 PM. You guys don't have to respond to this. I just need a place to vent... Again. So this depression has consumed and overwhelmed me completely. I now have a doctor that I am working with and it helps but most days are very dark. When I saw Rush in Salt Lake City, in July this past year, it may have saved my life. I used to live in Utah and days before my 21st birthday the man I was dating assaulted me, it changed me forever in ways I could have never imagined and I hate the person this event has turned me into and feel powerless to stop it. Like hello, I'd just like to know what it's like to go outside for once without being afraid and I'd like to go to the grocery store by myself without having a mini-anxiety attack. So my husband and I went to the Clockwork Angels screening last night. I was on such a high from watching it and reliving all of my memories. I have been abundantly blessed to see 6 shows on the tour this past year as well as the RRHOF induction and a Q&A session with Geddy and Alex sitting about ten feet away from me. So on the way home I was telling him about all of these things. I told him that I think Rush may have saved my life. There was something for me about seeing them in the place I had been assaulted and singing songs like "The Pass", "The Anarchist", "Wish Them Well" etc... My "healing" songs that make me feel better and maybe even stronger. I was telling my husband this on the way home last night. A few days ago he asked me if I wanted to try and save up for Paris so that we could go in five years I said "No, Paris will always be standing, Rush will not." So last night I mentioned that I was so looking forward to saving up for hopefully 6-10 shows on the next tour as a group of us Geddycorns have been discussing on Facebook, and he started to holler at me about money and debt. Mind you this is the man that was talking about saving up for a European vacation that would most likely be around 5-10k. I was crushed.. again. Not only was I stupid enough to open up my heart and express my feelings, I dared to get excited and hopeful about something. The argument then evolved into discussing our wedding. When we were planning our wedding we had a date set in October. Mind you we were eloping so making changes would have been a piece of cake. When I found out Rush was going on tour around the West/Southwest U.S. area I called to ask my husband if I could move the wedding date. At the time we had one honeymoon planned in Sedona and a "second leg" to go see Rush at their California shows. Had we moved our dates we would have not only been able to see more shows but we would have been driving on the exact route we had originally wanted to road trip on as well. He said no, he just didn't want to move the date so I respected his wishes and left things as they were even though I was disappointed. Last night after this came up he said, "Well, why didn't we go see them more on the last tour and why didn't we go to Dallas, Phoenix, and Las Vegas?!" I reminded him that I tried to change things around and that he was the one who said no to me. Then all of the sudden, out of nowhere, he says to me "Well, you said you didn't want to get married in November because of the weather in Sedona!" Uhm... Why the HELL would I have said that when I was the one who called and begged him to move our wedding date up just one month? I would have gotten married in a freezing ice storm if it meant I could have changed the date. Then this morning... I'm getting ready for work and he wakes up to use the bathroom. Our bathroom is super, super tiny so when I'm putting makeup on I have to lower the toilet seat lid and put my makeup bag on the seat to get ready. I asked him if he could wait, he didn't answer me. I asked him again, thinking he didn't hear me. Now I know my husband, he heard me but he didn't want to answer me, he just wanted me to drop everything and let him in. But remember, we were at the screening last night, it was 74 miles away from where we live, and I wasn't in bed until almost midnight and then up again at 5:00 am, I hit my snooze 4 times - I've had a much harder time waking up and getting out of bed with the depression- and was in a bit of a hurry to get ready. I thought he would know this. So instead of answering me he just says "nevermind" and walks away and starts doing the dishes in the kitchen. This was after I had gathered all of my makeup and was prepared to let him in. I just needed an answer. Then after I walk out he gets all mad at me for "not letting him in." Anyway, I can't win. I hate this, I feel like I'm constantly being mind-f*cked. Every time we have a disagreement if I mention hurtful things that I wish he would work on, or even if I nicely let him know something is bothering me he will try to find an example of me doing it, even if it was something I did once... 4 years ago, or whatever. And then it turns into "Well you did..." And I ask him, "Is there something I'm doing that you don't like and would like to discuss or have me work on?" And he goes "No." It's like he's just looking for examples to deflect things. Thank-you Rush Forum for being my padded room for the day. Edited by gangsterfurious, 19 November 2013 - 01:02 PM. Gangster, I know you said no one has to respond, but I feel compelled to on account of your "ending it all" thoughts. Please don't even think about that. Please. You are a pretty, intelligent and talented young woman and have so very much going for you. I really don't like to say much when it comes to a personal matter like marriage, but if your husband is emotionally starving you, maybe it is time to call it quits. Or separate for a time. Whatever you do, PLEASE know that you have people here that care about you and would be devastated if you ever did anything rash. I just came across this thread and am sorry for your situation. I'm glad you are apparently getting professional help. Given what you've said about your past, you've had a very disfunctional life, which is not your fault, but it can't help but impact your relationships (including who you chose to be in relationships with). First and foremost, you need to work on yourself. If your husband is supportive of that, then that tells you something. If he is not, then that tells you something too. But with everything that you've described, I don't think the health of your marriage is the most critical issue in your life right now. You can't really work on your anxiety and depression in a productive way if you are unhappy with your partner. It sounds like there is a lot of resentment and pain from the past. An excellent marriage counselor would be my #1 priority. Often, the things that seem "too hard" are the things we avoid, but those are the things we should be facing head on. Does that make sense? Agreed, but it's very difficult to work on your own health if your home is not a healthy environment. I know and that's what I'm doing even though it's been emotionally taxing and very difficult. My first visit with my therapist was with my husband. He tried to tell my husband things he could already tell he needed to work on and my husband kind of blew him off, didn't try to understand what he was saying, and was basically like "she's been through more stuff so she needs more help than I do." Even one of the first things the therapist said to him was "Do you even hear the things she tells you she needs and tries to say to you?" Because he watched my husband blow me off right in front of him. Therapist (to me): "How is your sleep? Are you getting a good night's sleep?" Me: "No, I don't sleep well at all, I'm lucky to get 5-6 hours most nights." Husband: "Well I sleep just fine!" Therapist: "Did you even hear what she said? That she's struggling with sleeping?" I hope your therapist takes the time and energy to explain to your husband that his behaviors are not conducive to improving the relationship. If there is anger and resentment, it has to be dealt with. I hope your therapist gives you concrete "homework" to work on. It doesn't sound like your husband has a lot of interest in understanding how you feel. The therapist should call him on it and find out why. Talking about the past is good for giving the therapist some background, but the goal is to work on present and future behaviors so you can have some common ground and build on something. Remember to take things one day at a time. It was good for your therapist to point this out. If I can make a comment well above my pay grade though, your focus in this thread seems to be on your relationship and the fact that your husband doesn't live up to your expectations, is insenstive or worse, etc. But you've identified yourself as having had an eating disorder, an alcoholic father (which of course is a form of child abuse), being homeless (a runaway? ), the victim of two sexual assaults and having suffered physical abuse by a former boyfriend. That is a horrific list. You probably have PTSD as well as other conditions. Just seems to me that working through all of that (assuming you haven't fully worked through it, which I'm guessing is the case), should be the focal point. Whether or not you made a mistake marrying this fellow I think you'll be able to figure out in a relatively short time. But I don't think you're having suicidal ideations because your husband made awful comments about your weight. It goes much deeper than that and the focus on your husband as being the primary source of your current problems to me is likely misdirected, even if it turns out he's an insensitive jerk who you should leave for your own well being. Stay in therapy. Follow your doctor's advice. Take your medication if prescribed. Good luck! I agree with this. The frustration with your husband has deeper roots - sounds like it's PTSD and a reflection of your struggle on him. Same for his reaction to you - I am not taking his side, but I'm sure he feels threatened by what you are telling him, going to therapy, etc. However, it's the therapist/dr. who needs to get through to him and it might not be in a couple's therapy situation. I'm sure when the therapist asked him if he was noticing your struggles, he heard "Why are you not noticing your wife is struggling because of YOU? Don't you get it??" Actually, my therapist would have said it differently if this were my situation " Sounds like your wife is struggling with sleep. How does that make you feel? What comes to your mind?" That seems to start a conversation more than "Did you hear that?" Being stubborn and threatened like that is tough shell to crack - but work on YOU first. He will show his support if he wants to, but the marriage can't be the focus right now - YOU have to be. Also, feel free to dump the therapist if this person might not be the right fit. If he is, that's great, but if not - it's all professional. Find someone else. Edited by iluvgeddy05, 20 November 2013 - 12:00 PM. Just wanted to pop back in and say thanks guys. Started by OldRUSHfan , 30 Dec 2015 love, music etc.